3M™ Littmann® Stethoscopes offers the high quality that medical professionals expect, and each replacement part and accessory meets the same demanding standards. Conveniently packaged in kits that correspond to our stethoscope models, Littmann stethoscope replacement parts and accessories make repairs simple. 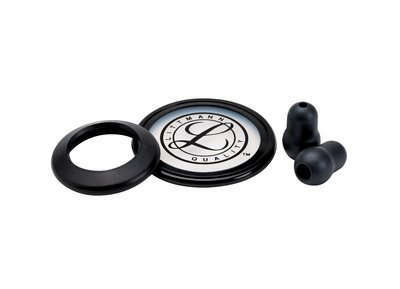 Each item is carefully manufactured to work seamlessly with existing equipment.3M™ Littmann® Stethoscope Spare Parts Kit for the Classic II S.E. stethoscope contains a black rim and tunable diaphragm for the adult side of the chestpiece and a black non-chill rim for the bell side of the chestpiece. Also included are two small (1/2 inch), black Snap Tight Soft-Sealing Eartips.Tunable diaphragm technology—a 3M invention—lets clinicians hear different frequency sounds by simply adjusting the pressure on the chestpiece. Hold the chestpiece with light pressure to hear low frequency sounds; press a little more to hear higher frequency sounds. This time-saving feature allows the healthcare provider to focus on the patient, while the non-chill diaphragm provides patient comfort.Snap-tight, soft-sealing eartips conform to individual ears for an excellent acoustic seal and comfortable fit. Eartips snap firmly onto the ends of the eartubes and, for safety, require a significant effort to remove.